We can engineer systems to suit every domestic/commercial application. Ducted reverse cycle air conditioning is the most efficient form of heating and cooling. Your home/office can be divided into individual air conditioned zones. The indoor unit of the appliance is generally mounted in the ceiling space or under floor (on transportable homes) and the outdoor unit is mounted outside, usually on a footpath, wall bracket or on the roof. Ducting and registers are used to distribute the heated/cooled air throughout a home/office building. Ducted evaporative Air conditioning provides a cheaper alternative to refrigerated air conditioning, both in installation and running costs. Also, repair costs in general for evaporative air conditioning can be considerably less than refrigerated. Evaporative air conditioning generally is a rooftop or wall appliance, that uses a combination of water, a pump, pads and a fan giving cooling through evaporation of water. 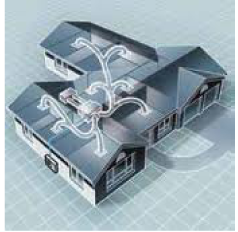 Ducting and registers are used to distribute the cooled air throughout a home/office building. Evaporative cooling is for cooling purposes only. Although, evaporative air conditioning can also be coupled up to ducted gas heating as well. 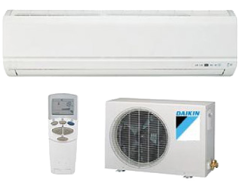 Wall split system/ floor console air conditioners are also an efficient for of heating and cooling. The indoor unit of the appliance is generally mounted on the wall (just under the ceiling), or up against the wall and floor (floor console unit). The outdoor unit is generally mounted outside, usually on a footpath, wall bracket or on the roof. Wall split/floor console units are available in reverse cycle (heating and cooling) models as well as cooling only models. The indoor unit and outdoor unit are connected together by several metres of copper pipe and electrical cables. 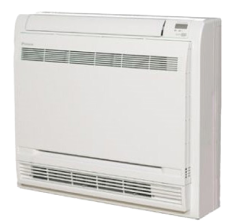 Room air conditioners are an appliance that are often installed by the home handyman, as they are relatively easy to install and a refrigeration mechanic is not required, due to the appliance being self contained (all in one). The appliance is simply installed usually in a window or cut hole in a wall and then just plugged in and ready for use. These type of appliances are becoming harder to obtain due to being older technology, rather noisy and not so efficient to run. With this in mind, manufacturers are focusing more manufacturing wall split units rather than these units.